KeiganMotor is able to communicate with other devices by Bluetooth Low Energy or USB and I2C Port. Basically, both of them use command communication with bytes and control KeiganMotor directly. Addition to it, Software Development Kits such as for swift will be released. Refer to this pages for bytes commands. 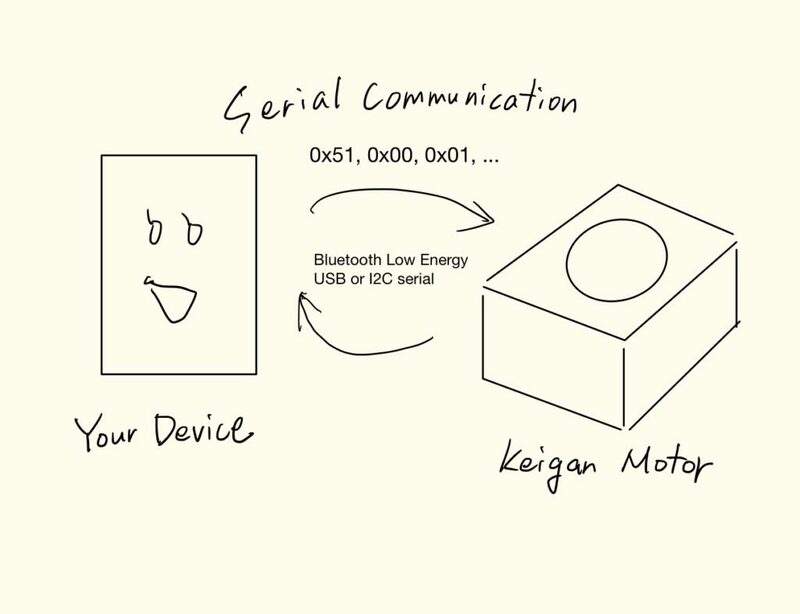 Devices that respond to more than BLE 4.0 can communicate with KeiganMotor. They are such as iPhone, Android, PC or Raspberry pi and so on. Refer to this pages to know using Bluetooth Low Energy (BLE) with KeiganMotor. Devices that respond to serial communication by USB-UART or I2C can communicate with KeiganMotor. Refer to this pages to know USB-UART . I2C communication will be supported by firmware update of KeiganMotor.